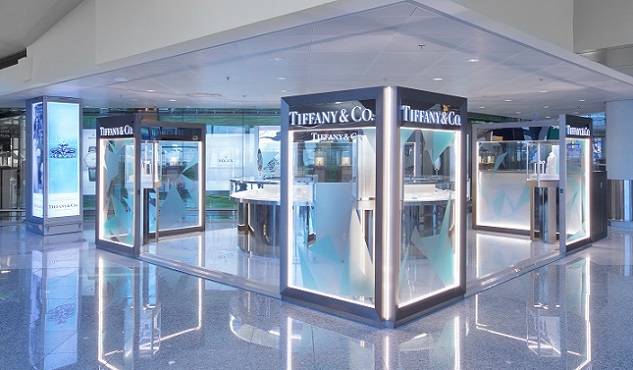 Tiffany & Co. launched its Hong Kong International Airport Pop-Up Store in June 2017! Located at Shop 6E188A, Departures East Hall, Level 6, Terminal 1 of the Airport, just a stone’s throw from Tiffany’s Airport store. Serving as an add-on shopping option for departing travelers, the Pop-Up Store showcases a new special theme in rotation. The Wedding Diamond Series is the first theme displayed after the curtain rises, and it will be followed by pop-up themes of Stylish Accessories, Christmas Season and Valentine’s Day. The Pop-Up Store is divided by floor-to-ceiling glass panels, an even more spacious impression is wonderfully refracted by lights. Viewed from above, the store is reminiscent of a stunning diamond, illuminating the entire Departures Hall with its resplendent glory. Together with simple graphic embellishments colored in the house’s legendary Tiffany Blue, travelers are to be embraced by a novel sensation of acquaintance. 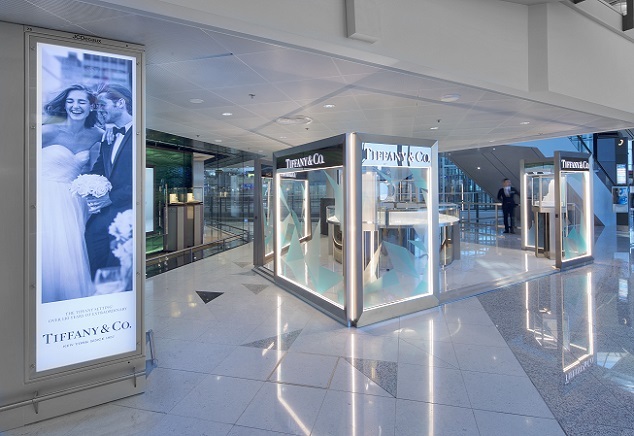 To celebrate the opening of Tiffany & Co. Hong Kong International Airport Pop-Up Store, Tiffany & Co. partners with Asia Miles to present “Tiffany Love Journey” event. During the event period, participants can scan the QR code on the digital panels located at the Airport’s Restricted Area with their mobile phones to open the photo app, then take or upload 6 romantic photos with their beloved for the online app to automatically create an exclusive photo album. Participants can then upload the photo album onto their personal Facebook Page or WeChat Moments with #TiffanyHongKong #TiffanyLoveJourney hashtags, and like Tiffany & Co. Facebook Page. After that, visit Tiffany & Co Hong Kong International Airport Pop-Up Store (Shop 6E 188A), present a boarding pass valid between June 11 and 25, 2017 and the uploaded ‘share’ on Facebook or WeChat, and complete a personal particulars form. Participants who expressed the sincerest feelings will have a chance to win 180,000 Asia Miles and other prizes.